Drybake Desert is level 2-1 in the game Paper Mario: Sticker Star. It comprises of a vast desert filled with quicksand and an underground area. The level starts in a grassy area where a Goomba can be found guarding the Sticker inside the block. This is not a requirement though. When the player continues on, a huge gate blocking the way to the desert. Using Paperize, a Jump, Hammer, Mushroom, Poison Mushroom, Fire or Ice Flower and Spike Helmet stickers must be placed in the gate to open it. The gate opens to reveal a short cave area inhabited by Swoops and a single Buzzy Beetle that can make the First Strike if it sees Mario. The cave exits to the desert itself, where a Save Block and Heart Block can be found, along with a Sombrero Guy. Traversing over the hill will reveal the Traveling Toad being attacked by a gang of Paragoombas. Once saved, the grateful Toad will give a Shiny Mushroom sticker as a reward. The next area is an area with a few quicksand flows and a hollow cave with coins. Pokeys are first found here. After that, there is a vast quicksand hill with Pokeys following the current. The Soda item is located at the downhill section, and south of that is a sandfall with two striped cacti, which indicate the hidden cave area is nearby. Sinking into the quicksand between the cacti will take Mario to a cave area with one of three Tablet Piece scraps. 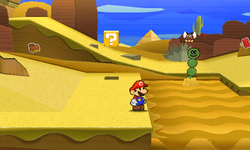 Nearby is a sand geyser that will take Mario back up to the divide of the sand flow. The flow then descends to the pyramid, where an HP-Up Heart can be found, along with the Comet Piece. The Secret Door is located behind the sole Sombrero Guy on the pyramid. It contains the Car Battery. Kara Kara Sabaku Dry Desert, kara kara being an expression meaning "dried-up". Shares a name with both Dry Dry Desert and Kalimari Desert.